Requires JScript Panel 1.3.0+ for full functionality. Will work with JScript Panel 1.1.0+ except tag writing won't be available. 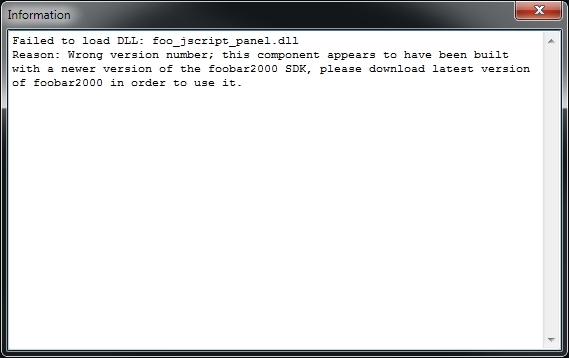 ^^^ Note that JScript Biography 0.8.5.2 and earlier versions won't work with JScript panel v2+. Existing users: If updating from v0.8.5.1 or v0.8.5.2, you just need to install v0.9. If updating from v0.8 to v0.8.5, to retain settings, install 0.8.5.2 first and before updating JScript Panel to v2+. 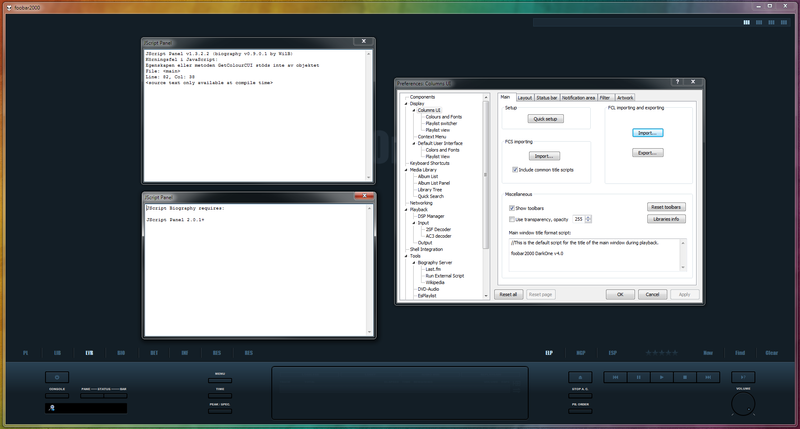 JScript panel 1.3.2.2 and JScript Biography 0.8.5.2 works just fine. Also tried "DarkOne v4.0 - Tedgo - JScript Biography Version (0.9.01) - Modified by WilB.fcl"
JScript Panel 2 requires foobar2000 1.4 (currently beta) and above. How did you force that? Just so anyone knows, the current SDK defaults to only requiring 1.3 or newer. JScript panel is used to run it, and that now requires foobar2000 1.4. You would need to get an answer from marc2k3 as to how and why he did it, as JScript panel is his plug-in. How did you force that? It's in marc2k3's changelog. I believe he did it because he's making a lot of breaking changes. OK, that explains it. I'll probably wait for a stable realease of foobar2000. Do you mean DarkOne v4.0 won't work with foobar2000 1.4 and JScript Panel 2 and WilB JScript Biography 0.9.0.1? The older v4 uses WSH Panel Mod for those UI Elements. JScript Biography 0.9.0.1 seems to work. Ok, great! Thanks for the clarification! Got a bit worried 'cause I just love DarkOne v4! is it possible to auto cylce artist bio und pics only for the current track (feat. Artist or the Solist, Orchestra etc.) and not between similar artist??? Save biography.ini & restart foobar2000. It should then auto-cycle bios and pics for tag items of the current track; e.g. artist, composer and performer, including items in multi-value fields, etc.